“Within recent years no such interest has been centred in any function in the capital of Ireland as that associated with the Sinn Féin Constituent Assembly, which commenced its deliberations in the Mansion House this afternoon. For some time past the opening sitting of An Dáil Éireann (to give the function its Irish title) has attracted a considerable amount of publicity, and all forms of rumours as well as speculations have been circulated with regard to it. In Sinn Féin circles, of course, the function was regarded with the utmost interest, but it is no exaggeration to say that the people of the country, as well as those of Great Britain and many other nations, anxiously awaited its deliberations” (undocumented press reporter, passed by the Press Censor, Ireland, 21 January 1919). The 21 January 2019 coincides with the centenary commemoration of the assembly of 28 (of 73) Sinn Féin MPs at Dublin’s Mansion House and their declaration of the first Dáil Éireann. The Cork Examiner and Irish Independent provide much detail on the event. Some hours before the opening of the proceedings, crowds began to assemble outside the Mansion House, and along the different thoroughfares adjoining the official residence of the Lord Mayor. It became apparent that the attendance of the general public would reach large proportions. Stewards on the streets were in place to make sure public congestion was avoided. Vehicular, tram, and pedestrian traffic along Dawson Street were not impeded to any great extent. Admission was by ticket and ticket-holders were formed into a queue – a system that was rigidly enforced. Those who did not possess tickets, lined the footpaths in the Mansion House quarter waiting for the arrival of the Republican representatives, and extended to each a hearty applause and cheer. The crowd increased as the afternoon advanced. Photographers, film and camera operators were plentiful. From the windows of houses in Dawson street several sightseers were accommodated with seats, and amongst those that were observed were Colonel W Edgeworthe Johnstone, Chief Commissioner of Dublin Metropolitan Police and Brigadier-General Sir Joseph Byrne, Inspector-General RIC, as well as some military officers who followed with a deep interest the happenings on the street. Several detectives in plain clothes mingled with the crowd or took up positions adjacent the entrance to the Mansion House. However, there was no interference with the Sinn Féin members of Parliament or public or the proceedings within the building. Early visitors who proceeded through Grattan Street to the Mansion House were surprised to find that the popular street, which adjoins Dawson Street, was decorated with Union Jacks and the flags of the Allies. The flags were exhibited in connection with an entertainment provided in the Mansion House in the forenoon for expatriated prisoners of war from Germany. This entertainment did not conclude until about ninety minutes prior to the commencement of the Constituent Assembly proceedings, and the soldiers, who were attached to the Royal Dublin Fusiliers, left the building in presence of the queue and large crowd gathered in Dawson street. Headed by their band, and accompanied by other soldiers and civilians, the soldiers marched towards the centre of the city without any incident taking place. In accordance with arrangements for the Mansion House, the members of the Dáil Éireann assembly, as well as the Press representatives, who were in attendance from many parts of the world, were admitted by the main entrance, and the public ticket holders by the side entrance. The sitting of Dáil Éireann was devoid of all ceremonial symbolism, and there was no Volunteer display outside or inside, the Mansion House. A majority of the Sinn Féin members of Parliament were in jail or in America. The Round Room of the Mansion House, which was spacious, was allotted to the assembly, and every part of it was quickly filled. The portion of the building underneath the lecture platform was occupied by the Sinn Féin MPs, while the galleries and other parts of the room were allotted for the accommodation of the public. 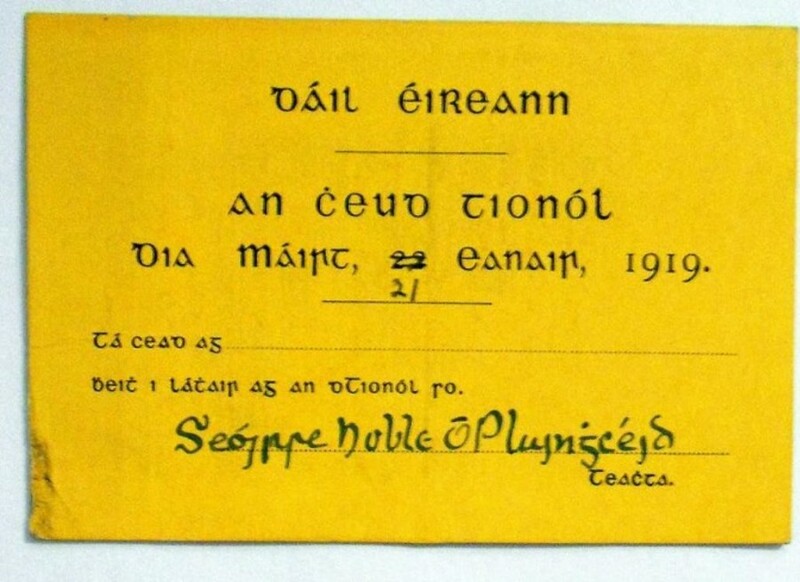 The attendance of the general public was large and representative, and included Rev M O’ Flanagan, Mrs Maud Gonne McBride, numerous Catholic clergymen, an Australian Catholic clergyman in uniform, a number of American Naval officers, but the labour movement had only a few representatives in the gathering. 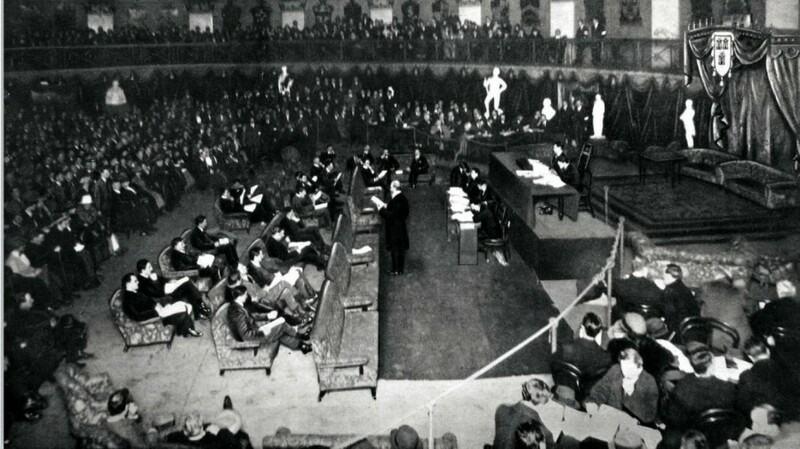 Three minutes before the time announced for the beginning of the proceedings, Count Plunkett, attended by his colleagues, entered the Round Room. As they proceeded to their seats the audience rose and indulged in loud and prolonged cheering. There was no delay in proceeding with the business of the meeting, which was conducted in the Irish language, with the exception of the announcement in English of some declarations after they had been first read in Irish. It was evident that the business transacted had been carefully prepared, as each of the Sinn Féin MPs was provided with printed matter, which they read in the order in which they were called upon to do so. The sitting occupied about two hours and was devoid of any incident except the enthusiasm which greeted the declaration of the Irish Republic.